A Proper Cornish Spring Break ! We have selected a few of our favourites below - have a browse and get ready for some 'fun times' ! 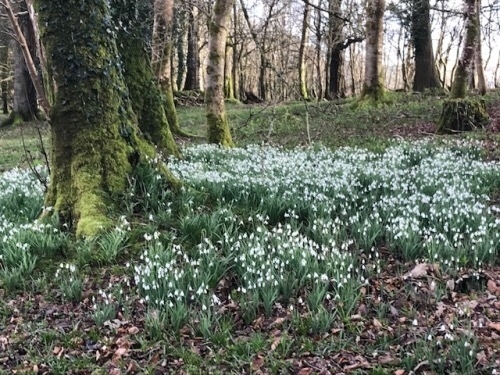 Wrap the family up warm, bundle them into the car, along with your four legged friend and take a short drive to Pencarrow to see the delights in this stunning 50 acre garden. Snowdrops are beginning to raise their pretty little heads creating an outside carpet through the grounds. Stop by at their onsite cafe for a well earned cuppa and warm home baked scones - other items are available ! This fantastic animal sanctuary located just outside Looe is where the kids (and adults) ! can get to meet 'Rascal' the Raccoon Dog along with his other rescued friends such as Lemurs, Meerkats, Zebra, Monkeys, Parakeets and Reptiles to name but a few ! Be sure to take the little ones along to the Childrens Farm where they can say hi to the adorable donkeys and feed the rabbits and guinea pigs. Ditch the car for a day at Liskeard train station and let the train take the strain on this scenic return trip to the picturesque town of Looe. Everyone will love peering through the windows at the wooded valleys and beautiful estuary, taking in the stunning views on this nine mile ride. Dogs are allowed to join in the fun too, perfect for all the family. Looe has something for everyone, try crabbing along the harbour wall - kids will love this, kit them out with a bucket and fishing net and see how many crabs they can catch before tipping them back into the briny, competition is rife ! There are plenty of places to eat to suit all tastes in this pretty harbour town with it's golden sandy beaches, great for enjoying some sandcastle time ! Visit The Screech Owl Park and make friends with this gorgeous little burrowing owl and other rescued feathered pals, some of them have been hand reared and tamed. There's plenty of fun activities going on during the day to keep both little ones and oldies amused. A couple of our favourites are the Owl Flying Displays where these lovely birds show off their skills and Animal Encounters where you can feed and stroke all sorts of other charming rescued animals including Racoons, Goats and Donkeys. Enter this watery world just a hop over the border from Cornwall in Plymouth, where several different species of sharks swim around you in giant clear tubes and be transported beneath the oceans ! Jelly fish, Stingray and Sea Horses weave their way through large tanks along with a huge array of other colourful flippy fish. Check out the Eddystone Reef's viewing platform - not to be missed, it's just like watching a huge live fishy cinema screen ! Don't forget to stop off at the Atlantic Ocean tank to see three different types of Ray and of course amble on to visit the very smiley clown and puffer fish ! A fun way for the whole family to spend a few entertaining hours and a godsend if it's raining !